Go Hydrology! : How to: The art of making water talk? How to: The art of making water talk? The map below breaks it down geographically. Around 400 people per day tap into Go Hydrology! 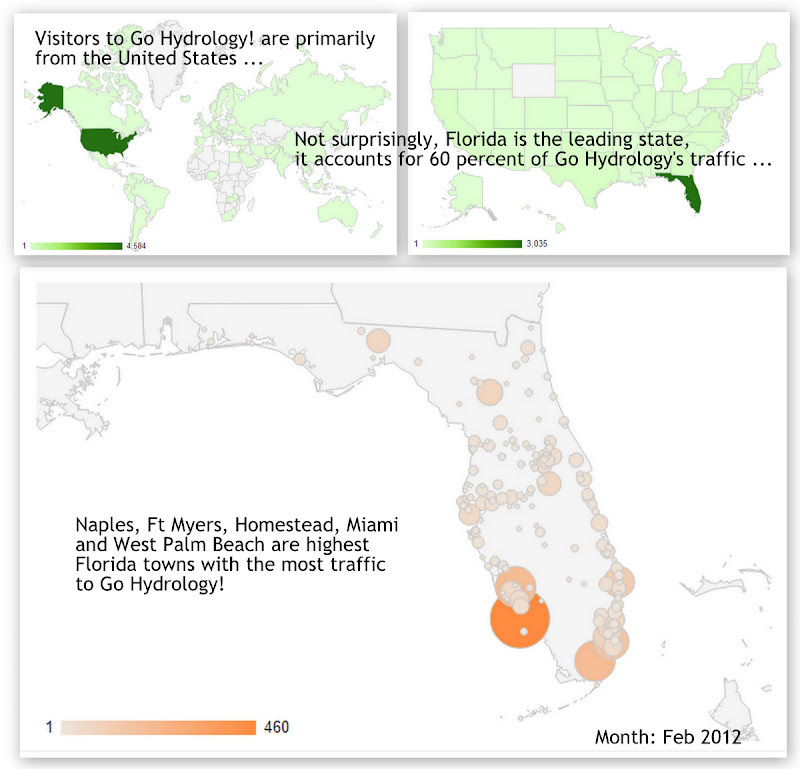 And Florida accounts for 60 percent of Go Hydrology's state-side traffic. As you can also see from the map, the heaviest (and most frequent) traffic sources to Go Hydrology are found in the southern part of the peninsular state: Naples scoring first with Ft Myers, Homestead, Miami and West Palm Beach scoring close behind. But tracking traffic isn't as easy as it seems. Eighty (80) people have signed up to receive Go Hydrology's daily email and another 150 people subscribe (and read) Go Hydrology by Google Reader (or an equivalent). People who tap in that way don't show up on the map stats, but in total all those sources adds up to around 400 people per day. While some of the graphics may be tricky to read at first, if you give them a chance, they provide a useful way to track the water cycle across the state of Florida, i.e. Lake O, Everglades, The Big Cypress, as it unfolds. I update them on a weekly basis. More than that, they allow you to do deep historical comparisons, too. And working with the data so the water can speak back. I love you Go Hydrology! My husband grew up in Florida and I just check you site to get a feel for the way he loved that area in hiking, camping and hunting and being as he is a biologist, I know the importance of water. I'm glad you called my attention to the cheatsheets the other day, I really like them. Good work! Thanks Mindy! Hopefully having those cheat sheet tiles right up front makes it easier to get to the data. Let me know if you see any gaps or any other suggestions. Thanks for posting this, I was just wondering over the weekend what the readership was. I also was looking for the Lake O stage chart recently and didn't realize it was right there on the right. Thanks for taking the time to share your knowledge via this blog. Thanks Eli, I'm glad they are useful. It's amazing how much information you give us on a daily basis! Thanks P for all your comments, too. It's nice to know that people are tuning in.